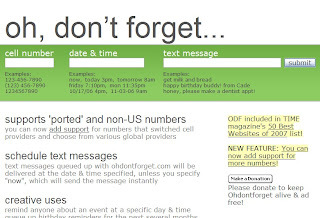 Ohdontforget is an online short message service for cell phone, that helps you send schedule text messages. Very simple put on your cell phone number, date and time, text message content, click "Submit", that is all. Of cause, you can send message at once. This service support most cell phone in U.S., It also support a few countries cells now. This service is free now.